Stabbings amid chaos at Calif. "Nazi mega-rally"
SACRAMENTO -- Several people were stabbed Sunday when members of right-wing extremists groups holding a rally outside the California state Capitol building in Sacramento clashed with counter-protesters, authorities said. Authorities say a total of 10 people were taken to the hospital. The Sacramento Fire Department says the injured included nine men and one woman ranging from 19 to 58 years old. At least five suffered stab wounds. California Highway Patrol Officer George Granada says about 30 members of the Traditionalist Worker Party gathered at the Capitol for a rally when they were met by about 400 counter-protesters and a fight broke out around noon Sunday. Fire officials said on Twitter that the protesters have cleared from the Capitol about three hours after the chaos began. The injured victims were all present while the protest took place, said Sacramento Police spokesman Matt McPhail. He said it was still unclear whether and how they were involved. Sacramento police said in a press release Sunday evening that during the event, police were approached by a citizen who located a loaded handgun on the State Capitol grounds. The firearm was turned over to police custody and was booked as evidence. The Traditionalist Workers Party had scheduled and received a permit to protest at noon Sunday in front of the Capitol. Matthew Heimbach, chairman of the Traditionalist Worker Party, tells the Los Angeles Times that his group and the Golden State Skinheads organized the Sunday rally. Vice chairman Matt Parrott, who was not present at the Sacramento rally, says it was a peaceful march and blamed "leftist radicals" for instigating the violence. Heimbach says that in the clash, one of their marchers had been stabbed in an artery and six of the "anti-fascists" had also been stabbed. In a post on their website TWP described the gathering as their "Thermopylae," in reference to the infamous Greek battle site where a small Spartan force stood up to a massive Persian army. They claimed the purpose of their gathering was a "protest against globalization and in defense of the right to free expression." The Bay Area Independent reports "members of the Traditionalist Workers Party, Golden State Skinheads, Blood & Honor, National Socialist Movement and Ku Klux Klan," had all planned to attend. Anti-fascist groups have been preparing a counter-protest, which they say will aim to shut down the "Nazi mega-rally." It is unclear how exactly the violence at the Capitol began. 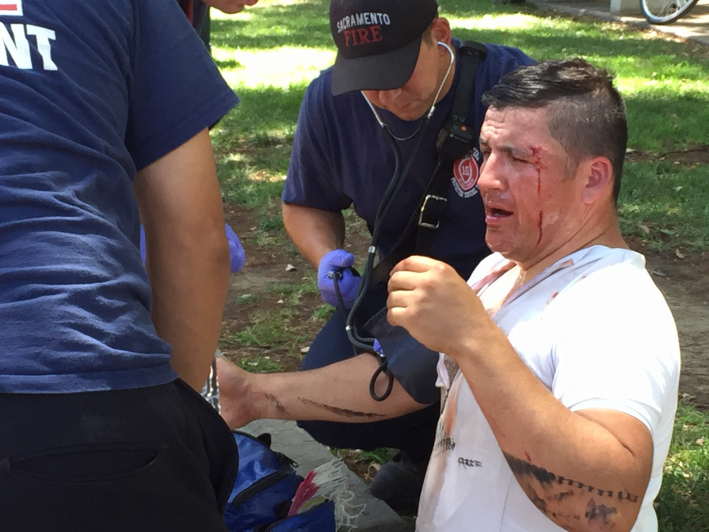 A similar violent incident happened at a KKK rally near Los Angeles earlier this year, when Klan members were confronted by counter-protesters and mayhem ensued. Witness video captured the brawl in an Anaheim park about 3 miles from Disneyland. Several protesters could be seen kicking a KKK member. One Klansman with an American flag used the pole's tip to stab a man. Officers on scene said they witnessed a Klan member stab a protester with a knife. They found a third counter-protester in a car also stabbed.